I hope everyone has a scary fun Halloween! I had the best time at my mega-exclusive private party. Only Iron Martin and Mr. Kitten were invited. It was a blast! We had jack-o-lantern faces cut into the cheese of our cheeseburgers, treats, goblin goblets, and costumes! Then we watched Night of the Living Dead. We even listened to scary music in the background while we ate our dinner! All-in-all it was mo awesome Halloween party. 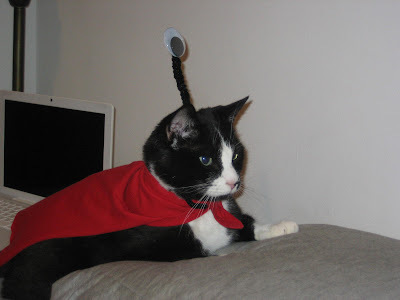 Here is a pic of Mr. K dressed up as Nibbler from Futurama. He loved it.... hehehe.